A 43-year-old Japanese piano teacher's sudden divorce from her online husband in a virtual game world made her so angry that she logged on and killed his digital persona, police said Thursday. 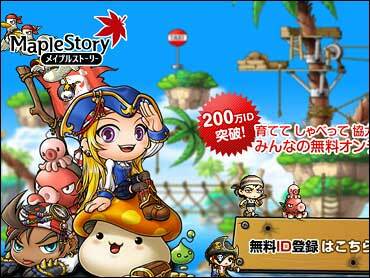 The woman, who has been jailed on suspicion of illegally accessing a computer and manipulating electronic data, used his identification and password to log onto popular interactive game "Maple Story" to carry out the virtual murder in mid-May, a police official in northern Sapporo City said on condition of anonymity, citing department policy. "I was suddenly divorced, without a word of warning. That made me so angry," the official quoted her as telling investigators and admitting the allegations. She has not yet been formally charged, but if convicted could face a prison term of up to five years or a fine up to $5,000. As in "Second Life" in the U.S., players in "Maple Story" raise and manipulate digital images called "avatars" that represent themselves, while engaging in relationships, social activities and fighting against monsters and other obstacles. The woman was arrested Wednesday and was taken across the country, traveling 620 miles from her home in southern Miyazaki to be detained in Sappporo, where the man lives, the official said. In recent years, virtual lives have had consequences in the real world. In August, a woman was charged in Delaware with plotting the real-life abduction of a boyfriend she met through "Second Life." In Tokyo, police arrested a 16-year-old boy on charges of swindling virtual currency worth $360,000 in an interactive role playing game by manipulating another player's portfolio using a stolen ID and password. Virtual games are popular in Japan, and "Second Life" has drawn a fair number of Japanese participants. They rank third by nationality among users, after Americans and Brazilians.